I still don't like bananas, but Zack continues to love them. 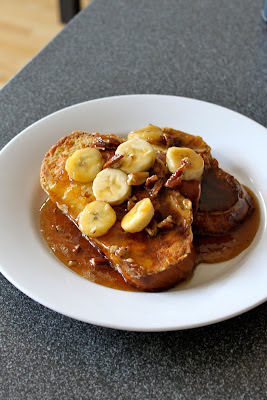 Since I love him, I made Bananas Foster French Toast for him on Father's day. Our little baby boy is due in less than 8 weeks so I wanted to make something special for Zack and knew he would love this special breakfast. Fortunately for me, you add the bananas in the last step, so I was able to enjoy a banana free breakfast. 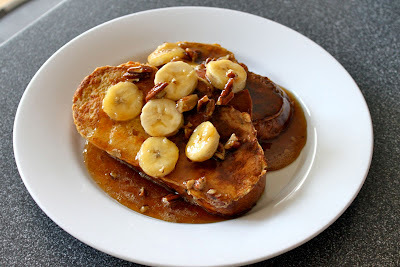 This breakfast was really delicious and very easy to make. It would be perfect for any special occasion. Set a baking sheet in the oven, and preheat oven to 250 degrees Fahrenheit. Heat a griddle over medium heat. In a large bowl, whisk together the eggs, milk or cream, and vanilla extract until somewhat frothy. Dip 2-3 slices (however many will fit on your griddle at a time) into custard mixture until completely moistened, and place on buttered and pre-heated griddle. Sprinkle top of each slice of bread with cinnamon while it is sitting on the griddle. Cook for 2-3 minutes, until golden brown, flip and cook and additional 2 - 3 minutes. When both sides are golden brown and bread is no longer soggy, remove from griddle and place on the baking sheet in the oven to keep warm until you have cooked all the French Toast. In a large skilled, combine corn syrup, brown sugar, maple syrup, and pecans. Bring to a boil over medium-high heat. Reduce heat, and simmer for 2 minutes. Add banana slices and rum extract. Coat the bananas with syrup mixture and simmer 1 minute. Spoon over French Toast. Serve immediately.